The National Publishing Company's Railroad, Post Office, Township, and County Map of Massachusetts, Rhode Island and Connecticut. With Distances in Figures Compiled from the Latest Government Survey and Original Sources. A large and impressive relic of the great age of American Railroads. 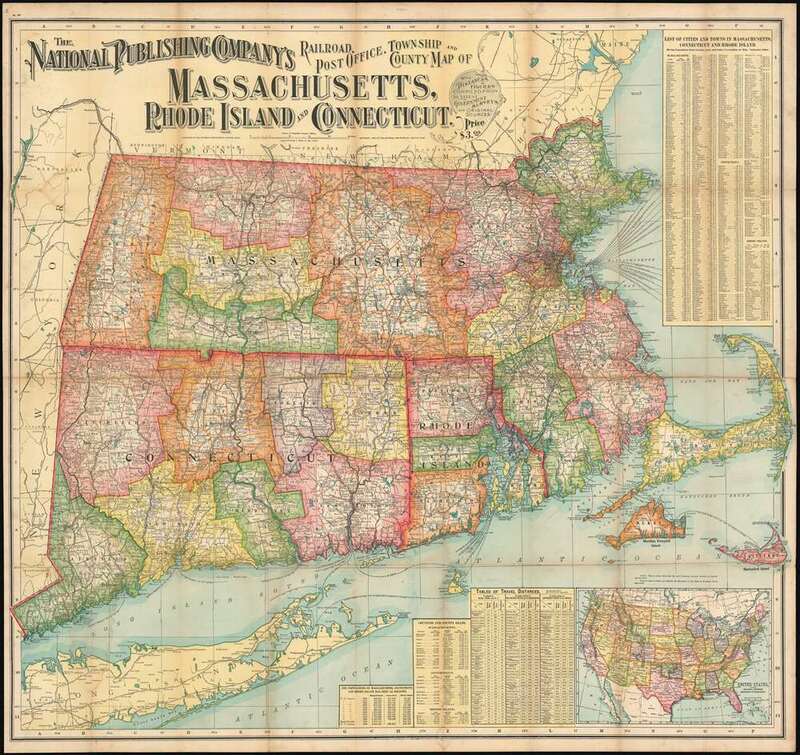 This dramatic map, issued by the National Publishing Company in 1900, covers the states of Massachusetts, Connecticut, and Rhode Island with adjacent parts of Long Island, Maine, Vermont, New Hampshire and New York. The map is color coded to show county and township configurations, but its true and evident purpose is to help travelers navigate the confusing network of train, trolley, and coach lines that operated throughout the region. This map shows major trunk lines heading to Hartford, Springfield, Providence, and Boston with numerous branch lines, most run my small companies, serving smaller towns and cities. When this map was printed the Age of Rail was well developed in New England with all but 20% of the region's towns and cities connected by one of the many private rail lines. This particular example of this well known map is issued in pocket map format and is much rarer than the more common, though identical, wall map issued at the same time. Very good. Minor wear and verso reinforcement along original fold lines. Attached to original binder.